Because I live in a colder winter climate, I know that this growing season will be gone before you know it and any fresh produce I get will have to be trucked in from a warmer climate. That's why I do what I can to preserve a little bit of the summer by filling my freezer with things that I either grow myself or purchase all summer at the farmer's markets. It's not too soon to start and in fact, it's easier if you do a little bit all summer and then before you know it, your freezer is full, fall is here, and you can relax knowing you are ready with healthy treats all winter long. I recommend buying twice the amounts of what you will need for the week when you go to the farmer's market. Make a double portion of say, green beans or broccoli and then freeze half for a dinner in winter. I buy a whole flat of strawberries; wash and cut the tops off; freeze half to three-quarters for smoothies; and then let the family snack all week on what's left. Why do I prefer freezing to other methods of preservation like canning? Freezing food is in my opinion superior to other preserving methods because more nutrients are preserved and the texture, color, and flavor of frozen foodstuffs are better than in food preserved by other methods. While no method of preservation completely saves all nutrients, freezing will preserve the most. Prepare and freeze food as soon after harvest as possible. Blanch your vegetables and for maximum nutrient retention steam blanch them for a short period of time. 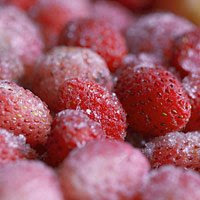 Most fruits need no blanching and can be frozen as is. When thawing foods do so in the refrigerator and not on the counter for the cooler refrigerator temperatures will thaw the food more slowly and mean less cellular breakdown and less nutrient drip which occurs during thawing. Use air tight packaging or double pack things. Moisture loss occurs when ice crystals evaporate from the surface of frozen food and the result is freezer burn. Yuck! A lot of people prefer to us vacuum packaging. I haven't ventured into that arena yet - but I know it keeps things fresher much longer. On Friday I will continue this theme of freezing by going over step by step instructions and giving you other helpful tips. In the mean time, here is a great link to more helpful freezing info from Kristen at Kristen's Raw on why she freezes raw vegan food. I freeze a ton of strawberries so my winter months are full of their delicious sweetness. I don't even bother taking off the tops because they go straight into my BlendTec blender to make my green smoothies. Yummy!